Despite popular belief, good dental health is about much more than cavity prevention. While removing plaque and tartar is an essential step, keeping those pearly-whites, well, pearly white is only part of the equation. An often overlooked aspect of dental hygiene has to do with your gums. To help shed some light on this area, today we are going to discuss proper gum treatment and common causes of bleeding gums. One of the most common questions regarding proper gum care has to do with bleeding gums. Specifically, what causes gums to bleed in the first place? To understand this topic, first, you must understand the role of gum in dental care and how they help contribute to your overall health. As you can you imagine, this tissue is rather delicate and is easily damaged. One of the most frequent causes of bleeding gums is brushing too hard – particularly if you use a toothbrush with hard bristles. Because of this, you should always opt for toothbrushes with soft bristles. While brushing, brush in gentle, circular motions. The idea is to massage the teeth and gums, versus scraping. Never brush back and forth, as this can cause gum issues, such as soreness, bleeding, or receding gumlines. Another issue that can cause swollen or bleeding gums is flossing too aggressively. Do not force or “saw” the floss between your teeth. Instead, gently slide it up and down, being certain to follow the curve of each tooth. If you have particularly sensitive gums, you can also find softer floss to help reduce irritation. Also, be aware that if you are new to flossing, it may take time to strengthen your gums, so bleeding may occur for the first few days. According to the Centers for Disease Control (CDC), nearly half of all Americans have periodontal disease. All told, some 65 million citizens of the United States of America suffer from gum disease currently. Cases range from mild to severe, with a higher prevalence in older adults (65 and older). But what, exactly, is gum disease? There are two common types of gum disease: gingivitis and periodontitis. Gingivitis is the least severe of the two. It is an inflammation of the gums – or gingiva – and develops after an accumulation of bacteria known as plaque gathers on the teeth. This form of gingivitis is called dental plaque-induced gingival disease. There is also a form known as non-plaque induced gingival lesions, caused by a number of factors, including fungus, a virus, genetic factors, and sometimes, no known cause at all. Signs that you have gingivitis include red and swollen gums, alongside bleeding gums. It is easily treated with proper dental care, including regular brushing and flossing. The addition of an antiseptic mouthwash can also help treat gingivitis as well. If gingivitis is left unchecked and untreated, it can develop into periodontitis, which is a much more serious gum disease that can lead to loss of teeth and other serious health issues. Periodontitis is a gum infection that affects the soft tissue and bone that support the tooth – also known as the periodontium. 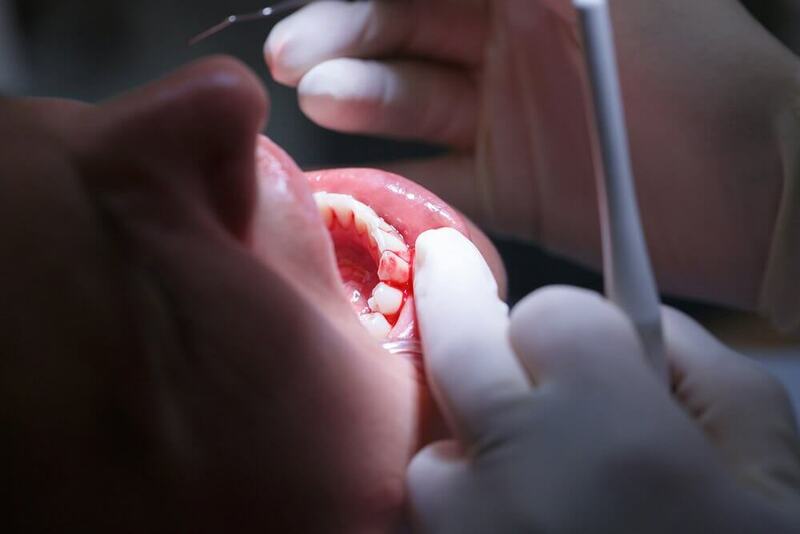 In addition to the loss of a tooth or teeth, periodontitis increases the risk of stroke, heart disease and heart attacks, and other health issues. Treating periodontitis starts in the prevention stages: proper dental care should help protect you from getting the gum disease. However, there are risk factors that can increase the odds of a patient receiving a diagnosis of periodontitis, including diabetes, cancer, smoking, genetics, and some medications. Aside from prevention, your dentist can treat periodontitis by removing plaque and tartar from your teeth and may prescribe dental drugs or gels to help combat the infection. In severe cases, patients may require surgical intervention. If you suspect that you may have a gum disease or experience bleeding gums for more than a few days, we highly recommend you contact a local dentist to assess your overall dental health.